From what I have read the point blank difference between the 308 and 30-06 is less than 25 yds and the 30-06 has a lot more kick. 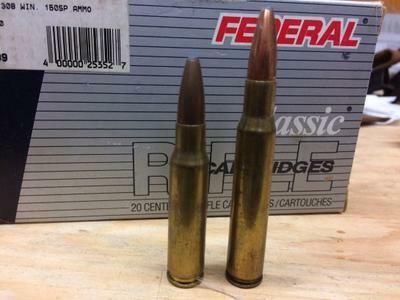 You should practice a lot so, a 308 for a new shooter would be the way to go. If long shots are what you need then go with a 300 magnum (point blank is about 100 yds over the 308 and 75 yds over the 30-06) and that is using the same weight bullet in each. My son hunts in Newfoundland and where he shoots, shots are between 25 and 50 yds so even a 44 mag rifle will do with the right bullet. The main thing is to get a rifle that you can shoot a lot, that is what will make the difference. If you can not shoot a 10" plate every time then you should shorten the distance you shoot. And I am talking about hitting it with 10 or more shots every time not 1 or 2 shots.